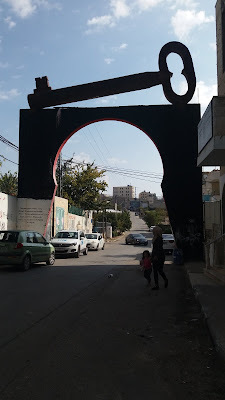 To enter the Aida refugee camp in Bethlehem, residents and visitors alike pass under a massive sculpture of a key. The key sits atop a keyhole-shaped archway over a main road which must be eight metres high. While international tourists and even many Israeli Jews might fail to understand the significance of this sculpture, what the key represents is among the highest priorities for most Palestinian refugees. That priority is known in Arabic as Ḥaqq al-ʿawda and in English as the ‘right of return’. First, a bit of background. In November 1947 David Ben Gurion, bouyed by a vote in the UN general assembly, declared Israel to be an independent, Jewish and democratic country. War quickly divided this land into Arab and Jewish sides and in May the following year armies from surrounding countries also became involved. 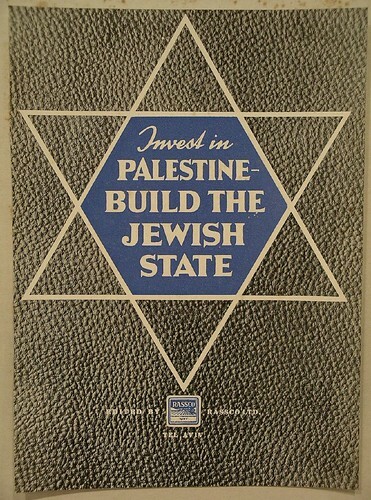 As the Jewish forces began to gain the upper hand, the Palestinian nakba, or catastrophe, began. Approximately 700000 Palestinian Arabs were forced off the land or fled the fighting with most ending up in neighbouring countries like Lebanon, Syria, Jordan and Egypt. Some made it to Chile, Canada or elsewhere and the vast majority were given refugee status by a new UN body called UNWRA - the United Nations Works and Relief Agency for Palestine. A further 300000 people became refugees during the 1967 war - though some of them may have suffered the misfortune of being made a refugee twice. Uniquely, this is to date the only refugee crisis in the world to have been assigned its own specific UN organisation. Also unique to the refugees from Palestine, this refugee status is passed down from generation to generation. Everywhere else, someone cannot be born a refugee and you cannot inherit the status from your mother or father. Because of this, over the last 70 years the number has quickly grown, to over 5 million registered people today. For most of these people, the struggle to be allowed to return is a fundamental part of their identity. Dr. Khalil Shikaki leads a team of pollsters in Ramallah called the Palestinian Centre for Policy and Survey Research who have paired up with a similar institution in Israel, the Institute for National Security Studies. Together they try to gauge public opinion in the region as it pertains to the occupation, the conflict and its resolution. They have done some amazing work and for any stats freaks their figures and findings are fascinating! Instinctively, anyone who knows Palestinian refugees will be able to tell you how important this ‘right of return’ is to typical Palestinians. Anecdotes abound, and the Aida camp is not only place where the symbol of the key to an occupied family home is prominently displayed. 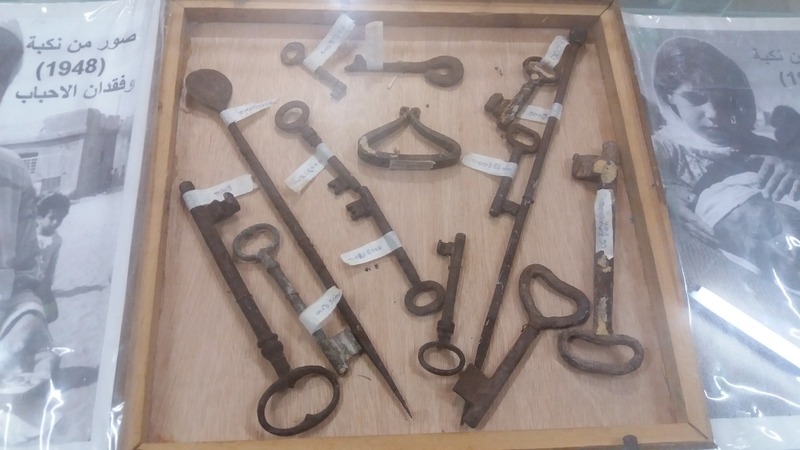 From exhibits like the tray of keys in a museum near Tulkarem (pictured) to the weekly March of Return protests taking place every Friday since this spring in Gaza, the message should be heard loud and clear. But for many on the ‘other’ side, the right of return is not considered realistic in the slightest. Shikaki and his team are uniquely placed to tell us how the issue is viewed in both Israel and Palestine and their numbers paint two vastly different pictures. Among Palestinians, the refugee issue polled higher than all other issues they asked about - bar one; not surprisingly, ending the occupation and achieving statehood itself. Even more impressive, 30% of Palestinians feel their number one goal should be obtaining the right of return. Many Palestinians who have never been to Haifa or Jaffa still talk nostalgically about the home that their forefathers had to leave. 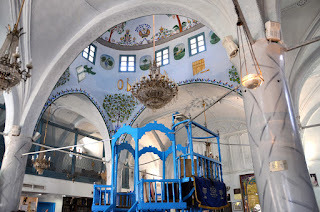 However, for Israeli Jews these very same homes tend to be generically labelled ‘Arab houses’ and are among the most sought after on the property market. No-one in Israeli politics talks realistically about this issue and it seems that very few living in Israel can understand how important it is to Palestinians. Statistics clearly highlight this divide and show us how reluctant Israelis are to allow any refugees to return in the future. When asked several months ago, 48% of Palestinians support this (39% in the West Bank and 61% in the Gaza Strip). However, this item receives the lowest support from Israeli Jews out of all the items tested: just 21% support the proposed arrangement on refugees. To further complicate matters, a majority of 52% of Palestinians believe that the US administration recently suspended its support for UNRWA because it seeks to permanently close the file of the refugees and deny them their right of return. Trump’s UNWRA cuts and his decision to move the US embassy to Jerusalem saw him firmly take the Israeli side regarding two of the most significant issues that anyone attempting a peace process will have to confront. However, all is not doom and gloom! There are two facts often overlooked by both sides which may totally change the landscape. The first; according to Shikaki, even if the right of return was made available to every Palestinian refugee on the planet, only 10% of them would chose live in Israel, and only 10% of them would take Israeli citizenship and an Israeli passport. Despite the rhetoric and noisy protests, most have no desire to pack up their lives and move to the Jewish State and only 1% of the total would be likely to claim both citizenship and residency. Especially if the choice to move to a valid, autonomous Palestinian state was on the table, only 65000 would likely come to Israel. The reader should keep in mind there are over 300000 non-Jewish foreign workers living in Israel and between 10 and 20000 Palestinians cross into Israel illegally every day. The second point to consider is that Israel is uniquely placed to welcome and integrate new migrants. In the 1950s the young state successfully absorbed over 1 million refugees from Arab countries. Most of them did not speak Hebrew, came with no property, money or other assets yet within a generation have contributed enormously to the Israeli economy and its cultural life. The fact that these people were Jews should make little difference to a democratic state. More recently, over a million people from the former Soviet Union arrived in the 1990s, often with little reference to Jewish or Israeli culture. Integrating these people was also largely done in an efficient and effective way. The ‘aliyah’ centres that are spread across the country do an amazing job helping new migrants open bank accounts, move into housing, learn Hebrew and find a job. No system is perfect, and plenty of people have tried and failed to make the move to Israel, but it is a point often overlooked by many Israeli Jews that if the right of return were to be taken seriously, there is probably no place on Earth better equipped to handle it than Israel. If you want to learn more about this issue join us for a tour! Our Nablus tour visits the Balata Camp while our Bethlehem tours visit the Aida refugee camp itself, so you can meet the people affected and explore this topic for yourself.